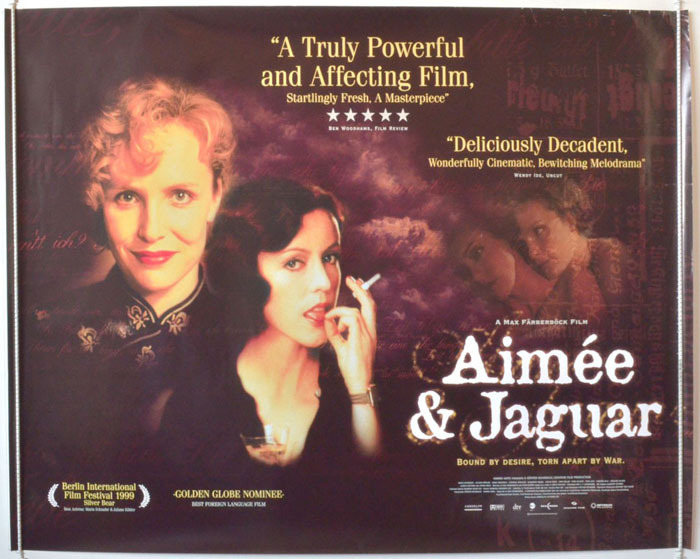 “Aimee & Jaguar” is a beautiful love story told against an unimaginably bad backdrop: World War 2 Berlin. Felice (Maria Schrader) is an adventurous sort with a honed survival instinct. She needs it. She’s Jewish, living in Berlin in the waning months of World War 2. Far from hiding out, she runs free during the Battle of Berlin. Naturally, she doesn’t tell anyone she’s Jewish, which is fortunate, since she has a job as a journalist for a Nazi newspaper. “Hiding in plain sight,” I think they call it. In addition to being Jewish, Felice is also a Lesbian. She doesn’t engage in long romances, preferring to have a series of casual, semi-regular lovers, one of whom is Ilse. Ilse works as a housekeeper for Lilly Wust. Lilly’s husband is a Wehrmacht soldier on the Eastern Front. She spends her days caring for her four sons and, every now and then, sending Ilse to take her kids to the zoo, so that she can screw around with various men. On Lilly’s birthday, Felice and the couple’s Lesbian friends throw Lilly a party that turns into a drunken make-out fest. Lilly passes out in bed with a naked Felice. This is all fine, until Lilly’s husband comes home to surprise her on her birthday. Lilly’s husband…suffice to say he doesn’t take it very well. He flips out, expecting Lilly to beg forgiveness. Instead, she demands a divorce. As the Allies move closer, the Gestapo intensifies their search for Jews in Berlin. Felice’s friends have acquired fake passports, and plan to escape. Felice decides not to go–she wants to stay with her love. Bookending this love story are scenes of two old ladies at a retirement home. Ilse is already a resident when one day Lilly is brought there to live. In the opening scene, we just see their first moment of recognition. In the ending scene–after seeing how events played out during WW2–Ilse and Lilly have a difficult discussion about Felice, and what happened to her. This is not a film with a happy ending. Few romances with Jewish women in World War 2 Germany had happy endings. What makes “Aimee & Jaguar” such a watchable film is that we don’t get bogged down in lots of pondering: there’s too much real-life going on, too many bullets and bombs and Nazis to spend time ruminating. Felice knows she could be caught and killed at any time. She’s Jewish, a Lesbian, and an operative in an underground movement leaking secrets to the enemy. She also lives for the moment. After we see present day elderly Ilse and Lilly going inside the retirement home for lunch, there’s a brief coda from the WW2 days. Felice is alive and vibrant, as always, and she makes a speech about not wanting forever, but wanting a series of “right nows. Now. Now. Now. Now.” That’s how she lived her life. The entire group of women in “Aimee & Jaguar”‘s Lesbian circle are played by wonderful actresses. None of them play their characters as campy or butch: these are just young women who are friends, and who enjoy the love of other young women. Excellent supporting cast aside, the film would be nothing without a standout Felice and Lilly. Maria Schrader is perfect as Felice: she’s brash, stylish, fearless, and makes every move with purpose and certainty. Felice was flashy, but in many ways, Lilly was the more difficult role, simply because of the entire spectrum her character plays. She’s a mother and loving wife, an adulteress, a daughter, and–ultimately–the passionate lover of another woman. Even when Felice confesses to Lilly that she’s Jewish, Lilly doesn’t stop loving her. Juliane Koehler does a splendid job as Lilly. Reduced to its elements, “Aimee & Jaguar” is a love story and a war story. It feels like neither. There’s some sort of alchemy that just makes “Aimee & Jaguar” a compelling story about a brave group of people. It transcends pigeonholing, and it’s a very good movie. That’s about the best any movie can do. 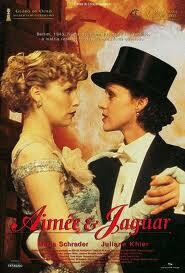 This entry was posted in Films, Foreign, LGBT Issues and tagged Aimee & Jaguar, booksandmoviesandcrap.com. Bookmark the permalink.